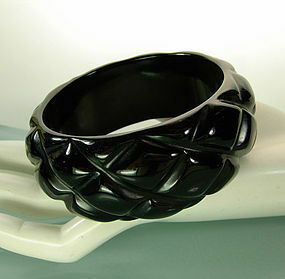 Beautiful wide black bangle with a super chic quilt motif. Great for layering or a perfect statement on its own. Circa 1970. 1 1/4 inches wide, 1/2 inch thick, and 2 9/16 inches inside diameter. Excellent condition. Photos enlarged to show detail. Display form is lifesize.